Eleven-year-old Jonah Larson's favorite hobby is crocheting, which he turned into a business. He made this blanket in January during a snow day from school. Jonah Larson taught himself how to crochet at age 5 by watching YouTube videos. 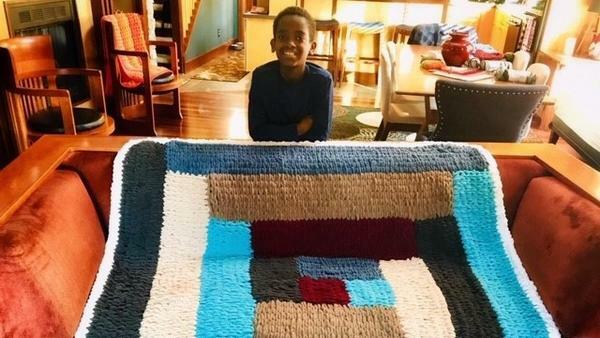 Now 11, he has been described as a "crocheting prodigy." He has his own crochet business, called Jonah's Hands, based out of his home in La Crosse, Wisc. Crocheting has also made him a social media star — but he doesn't do it for the fame. Jonah has more than 46,000 followers on Instagram, where he sells his goods. "After a very hard, busy, chaotic day in this busy world with school, it's just nice to know that I can come home and crochet in my little corner of the house while sitting by the one I love most: my mom," Jonah tells NPR. His mother, Jennifer Larson, doesn't crochet, but she does run his Instagram account and has joined a few Facebook crocheting groups on his behalf. It's up to Jonah, she says, to decide what he does with the profits. "I don't buy his yarn for him. He buys his own yarn from the profits he makes from selling," she says. "He saves some money, he's investing some money and he donates as well. So those are things I think are important in life for adults to do, and I'm glad that he can learn that at an early age." "I hope people gain from seeing my work is it makes them happy too," Jonah says. "When I see my crochet work when it's done, it blows my mind to know that I, an 11-year-old with a tiny hook and a ball of yarn, made this amazing afghan, scarf, cowl, you name it." JONAH LARSON: Hi, crochet friends. It's Jonah. That is the voice of Jonah Larson, described as a crocheting prodigy. He started teaching himself the craft at the age of 5 by watching YouTube videos. Now, a seasoned sixth-grader, Jonah's hands can whiz through complicated stitches with ease. It has won him prizes and made him a social media star. But Jonah doesn't do it for the fame. LARSON: After a very hard, busy, chaotic day in this busy world of school, it's just nice to know that I can come home and crochet in my little corner of the house while sitting by the one I love most - my mom. Now, there are plenty of kids actually that love to spend time with turning yarn into colorful gifts. And for Jonah, this has become a business. He shows and sells his work on his Instagram account. MARTIN: Jonah has more than 30,000 followers. Know that he makes blankets. INSKEEP: Thirty-thousand followers - oh, go on, go on. MARTIN: Thirty-thousand followers - blankets, scarves, hats, handbags, even toys like stuffed octopuses (ph) - the list goes on. Jonah is also stitching together a career as a philanthropist. He regularly donates some of his goods and money to the Ethiopian orphanage where he was adopted as an infant. LARSON: I've sent back Afghans, baskets and coasters. And I have raised $400 at an auction. INSKEEP: After a profile was published his local paper, the La Crosse Tribune, Jonah's account was so inundated with orders - more than 2,500 orders - that he has had to temporarily stop taking new requests in order to catch up. He's only got two hands. But he's excited to know that his work is reaching so many new homes and hearts. LARSON: I hope people can see my work if it makes them happy too. When I see my crochet work when it's done, it blows my mind to know that I, an 11-year-old, with a tiny hook and a ball of yarn, made this amazing Afghan, scarf, cowl - you name it. MARTIN: You could say Jonah is hooked on the feeling of being a crafter for now. But in the future, he hopes crocheting will be great practice for becoming a doctor. Transcript provided by NPR, Copyright NPR.